Raumfahrt+Astronomie-Blog von CENAP - Blog: Raumfahrt - ISS-ALLtag: Japanese Cargo Ship Departs Space Station. Next Stop: Oblivion. Astronauts on the station released the HTV-7 supply ship from the station using a robotic arm at 11:51 a.m. EST (1651 GMT) as both spacecraft sailed 254 miles above the northern Pacific Ocean. The Japan Aerospace Exploration Agency (JAXA) launched the cargo ship to the station in late September to deliver more than 5 tons (4.5 metric tons) of fresh food, science gear and other supplies. JAXA's HTV cargo ships (short for H-2 Transfer Vehicles) are disposable spacecraft designed to haul tons of supplies to the space station, and then depart and intentionally burn up in Earth's atmosphere at mission's end. 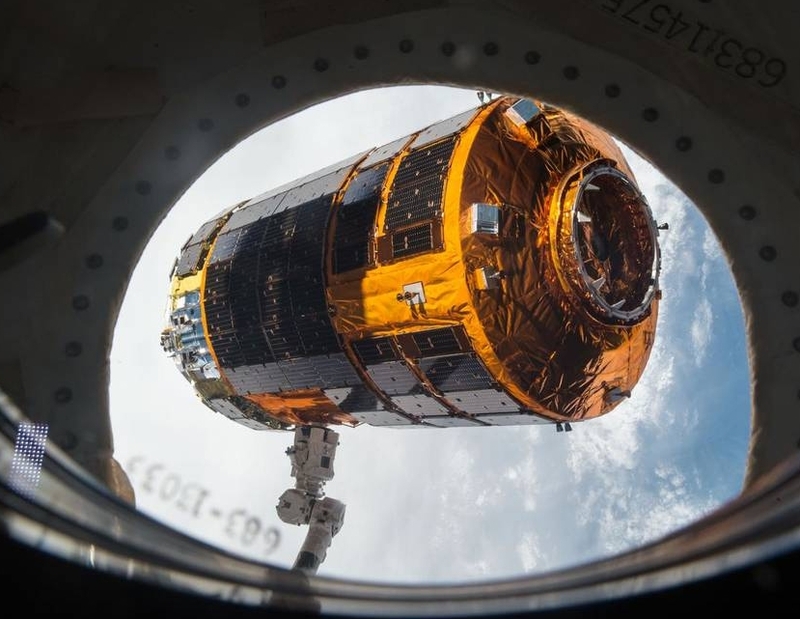 The spacecraft, also known as Kounotori (Japanese for "white stork") are part of a fleet of robotic cargo ships from Japan, Russia, Europe and the United States that have kept the station stocked with supplies over the last 18 years. HTV-7 delivered some critical supplies for the International Space Station's crew, including six new batteries for the orbiting lab's solar power grid. It also carried two tiny cubesats for a space elevator experiment (which were deployed Oct. 6) and a small re-entry capsule that, in a first for Japan, will attempt to return experiments to Earth. If all goes well, the capsule will be deployed just before HTV-7 falls back to Earth over the South Pacific on Saturday (Nov. 10), NASA officials said. Called the HTV Small Return Capsule, the cone-shaped vehicle is 2.7 feet wide (0.8 meters), 2.1 feet tall (0.6 m) and weighs 397 pounds (180 kilograms). This NASA graphic shows the location and relative size of Japan's HTV Small Return Capsule on the HTV-7 cargo ship. The capsule will test sample return technologies when it falls to Earth on Nov. 10, 2018. "The return capsule will be ejected from a hatchway after the deorbit burn," NASA officials said in a statement. "The experimental capsule will perform a parachute-assisted splashdown off the coast of Japan, where a JAXA ship will be standing by for its recovery." NASA officials said the capsule is carrying protein crystal growth experiment results. Gerst wished the team behind the re-entry capsule luck in their upcoming technology test. It was he and his Expedition 57 crewmates who packed the capsule with its experiment cargo and attached it to the HTV-7 hatch. "We congratulate all the participating engineers for the successful design and assembly of the small return capsule, and we wish all the best for the upcoming, most interesting, phase of the return capsule mission: the re-entry and descent." Japan’s HTV-7 resupply spacecraft has bid farewell to the International Space Station (ISS) on Wednesday, although its mission isn’t over just yet. 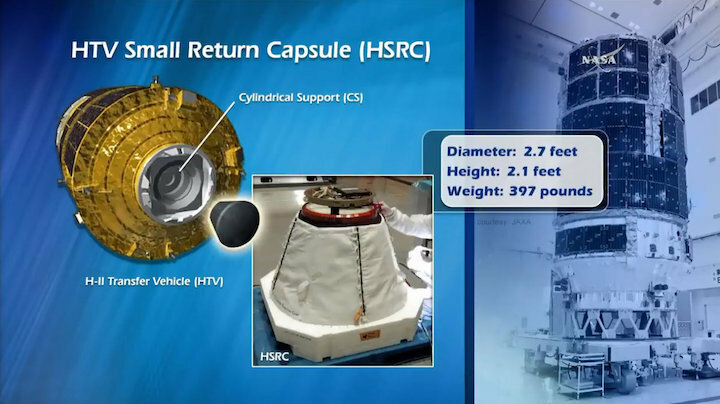 HTV-7 will release the Small Re-entry Capsule (HSRC) during its final days in space, allowing for a technology demonstration, ahead of the resupply craft’s final farewell via a destruction re-entry. HTV-7 began its mission atop a H-IIB rocket from the Tanegashima Space Center on September 23 local time, ahead of a journey to arrive at the ISS with its array of cargo. 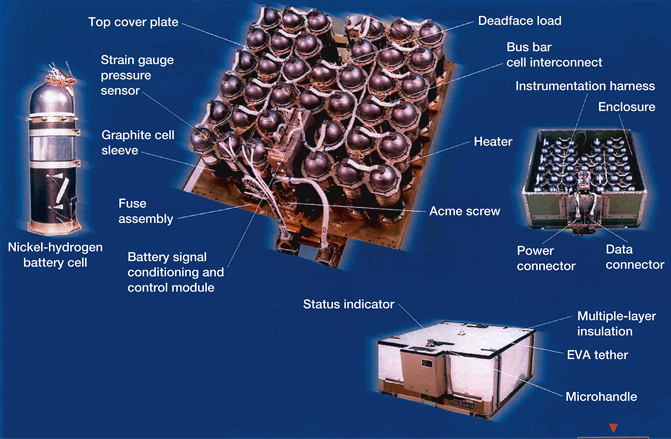 The upmass comprised of 13,700 lb (6,200 kg) of internal and external payload/cargo elements. Internally, inside the pressurized section, HTV-7 delivered two new U.S. science racks, a new U.S. Life Sciences Glovebox (LSG), a new Life Support Rack from ESA (European Space Agency), the HSRC, a Loop Heat Pipe Radiator technology demonstrator, the JEM Small Satellite Orbital Deployer and CubeSat, three CubeSats, as well as cargo, food, clothes, and other provisions for the Station crew. In the external unpressurized section was four HTV mission plan of delivering new lithium-ion batteries to the ISS. A total of six Orbital Replacement Units (ORUs) of the new batteries were hauled to the Station on HTV-7 for installation over a duo of spacewalks (EVAs). However, those EVAs were delayed after the Soyuz MS-10 incident saw one of the upcoming spacewalkers – Nick Hague – fail to make it to the Station. No new date for the two EVAs has been noted at this time, although the batteries are currently stowed on the outside of the ISS ready to be installed when the spacewalk replan effort has been completed. Now refilled with trash to be burned up with the HTV at the end of its mission, one final task was required from the ISS crew, which was in preparation for the HSRC task. “The crew assembled the HTV Capsule Support Plate and Support Cone in preparation for Capsule Sample installation. The entire assembly (was) attached to the vehicle’s bulkhead as part of the HTV-7 egress timeline,” noted L2 ISS information. With the HTV hatch closed, ground controllers used the Space Station Remote Manipulator System (SSRMS) to grapple HTV-7’s from the Mobile Base System (MBS) Payload ORU Accommodation (POA) and installed on its Unpressurized Logistics Carrier (ULC). The SSRMS was then maneuvered and successfully grappled HTV6’s Flight Releasable Grapple Fixture (FRGF) in preparation for release. Ahead of the end for HTV-7, trash items were loaded into its place and the Common Berthing Mechanism (CBM) hatches between the vehicle and the ISS were closed. Following CBM vestibule depressurization and removal of all 16 CBM bolts (in four stages of four bolts), marked the unattaching of the vehicle, whilst under the firm grip of the SSRMS. Over the following few hours, the SSRMS maneuvered HTV-7 to the release position around 30 feet below the ISS, following which, with both ISS and HTV-7 thrusters inhibited. HTV-7 was then ready to be released by Expedition 57 Commander Alexander Gerst of ESA (European Space Agency) and Serena Auñón-Chancellor of NASA inside the Robotic Work Station (RWS) in the Cupola module. The SSRMS ungrappling of HTV-7 was next, to signify its release from the ISS. After a period of 90 seconds, the ISS crew sent the retreat command to HTV-7, which initiates the departure sequence burns. In total – per the timeline – four departure burns were called for, known as ISS Departure Maneuver (IDM) -1 and -2, followed by Descending Maneuver (DSM) -1 and -2, following which ISS and HTV-7 integrated operations officially ended. 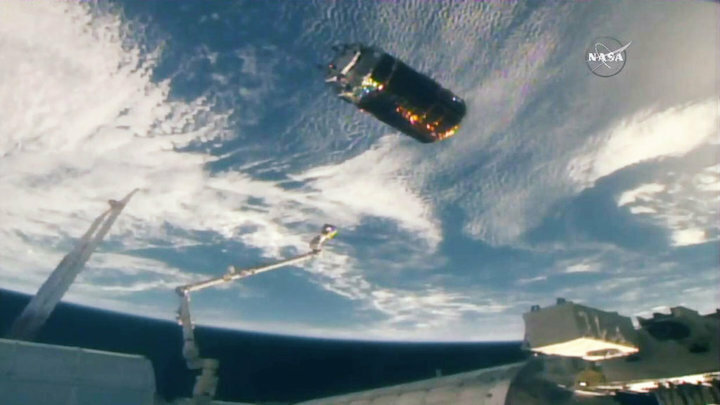 HTV-7 will remain in orbit for several days before conducting a series of de-orbit burns for a destructive re-entry over the Pacific Ocean on Saturday. During preparations for its destructive reentry and after the deorbit burn but before entry interface (the point at which the discernable atmosphere begins to affect a spacecraft), ground controllers will remotely command HTV-7 to release the HSRC capsule at an altitude of 300 km (190 miles). HSRC will then use its 3D printed nozzles to autonomously control its attitude during atmospheric reentry. Once through reentry heating, a parachute will guide HSRC to a safe splashdown in the Pacific Ocean off the coast of the Ogasawara Islands for recovery. 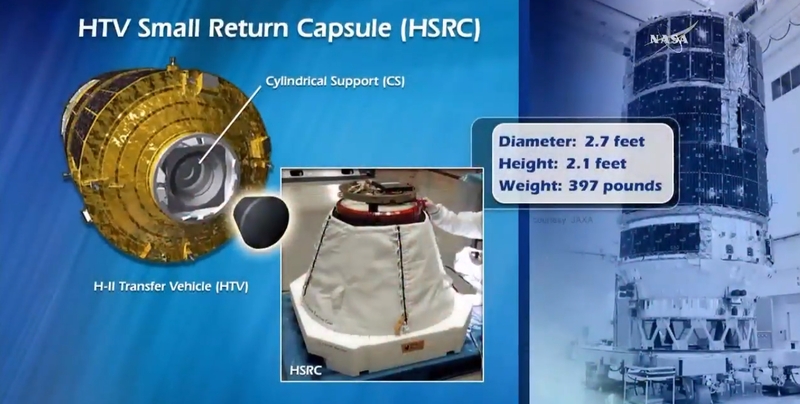 Overall, the goal of the HSRC is to demonstrate its reentry and scientific sample return capability (max 20 kg, or 41 lb) – which will presently make it only the second craft capable of returning experiments from the International Space Station, the other being SpaceX’s Dragon. Because HSRC needs to splashdown in an area where recovery will be easy to accomplish, HTV-7 will have the distinction of being the first JAXA Station resupply vehicle to perform a destructive reentry over the Northwestern Pacific Ocean instead of over the Southern Pacific Ocean spacecraft graveyard that has been used on all six previous HTV missions.